A bad cut will ruin even the best of cigars, so it's important to snip your smoke correctly to avoid problems later. Before you begin, it's important to know that the object of the cut is to create an ample. smooth opening for smoking without damaging the cigar's structure. With most cigars, this means cutting away part of the cap on the head that closes the cigar, while leaving some of it glued around the end to keep the filler leaves together. Next, you need to select the right cutting tool. There are a myriad of options available: single- and double-bladed cutters, scissors, v-cutters, a sharp knife, or even your thumbnail. If you are just starting out, though, we suggest choosing a double-bladed cutter, as they are the simplest to operate, are designed to make a cut across the cigar from both sides simultaneously, and can snip any shape or size smoke you'll see in a humidor. With a double-bladed cutter, there's less of a chance that the cigar wrapper will be torn, whereas other cutting tools require a bit more experience. Start by identifying the shoulder of the cigar-the place where the curved end of the cigar starts to straighten out. This is where you'll make your cut. 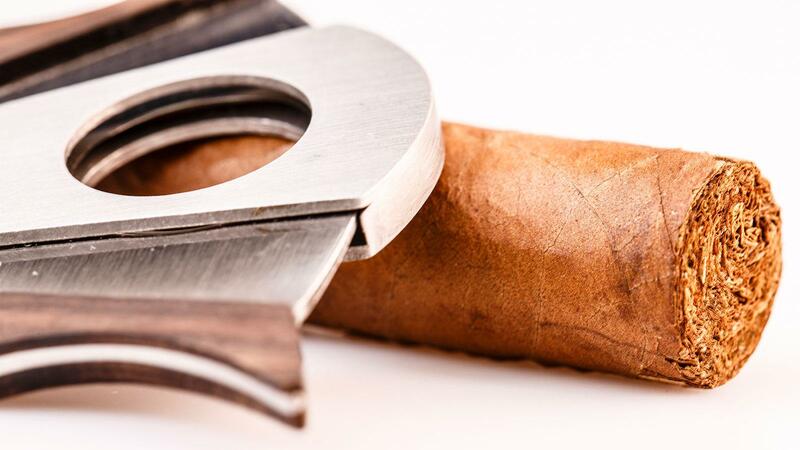 Place the head of the cigar inside the opening of the double-bladed cutter, and slightly close the blades so they are just touching the cigar. This keeps the cigar properly positioned and prevents motion, which might lead to tearing or to the cut happening in the wrong place. Once the cigar is in position, cut it boldly using swift, even pressure. A true aficionado cuts like a surgeon: quickly and confidently. If you're having trouble, a simpler way to cut your smoke is to open the blades of the double-bladed cutter and lay it on a flat surface. Then, insert the head of the cigar in between the blades so that it rests evenly on the surface, and finally, swiftly clip the head of the cigar. This is a surefire method to achieve a perfect cut.